Had someone suggested to me 3 months ago that I would be writing this piece, I would have laughed. To be blatantly honest, I have been happy using my trusted Shure combo on snare drums for years, the Beta57A on top and the SM57 on the bottom, and I felt no compulsion to change. This configuration has been my thing on small club shows through to outdoor festivals and arena's, so why would I bother changing? â€¦â€¦ Yet, one night, there came a show where I needed to use my SM57 for a guitar mic, and I was stuck. There were no 604's, no beta57's, only a large diaphragm condenser mic left in the house kit, and all my mic's were up on the kit, backline and vocals already. The in house engineer pulls out this thing- it looked different, with the thin rubbery rim around the middle of the grille, but it felt sturdy enough. "Try this" he said. I replied, somewhat hesitantly, "Ah, ok", and moved to put it on bottom snare. The in house expert suggested "put it on top, it will be much better than bottom", and so , trusting the man that supplied me with this odd looking snare mic, I relegated my beta 57 to bottom position, and placed this on top (you should always listen to the opinion of the in house guy- he knows the room and the gear in it!). I wandered down to FOH, and immediately started running through my usual linecheck and EQ, beginning with the overheads before moving to snare, not really knowing what I was going to hear. CRACK! â€“ From that first hit on the snare, I was thinking, wow, that sounds pretty awesome, maybe the overheads were doing something wonderful in the room. So, I took them out, just leaving this thing on top snare turned on. And again. CRACK! But with depth. .Lots of depth! No EQ, no compression, no overheads, just this mic. From that moment I was sold, and I have not had my mind changed since. 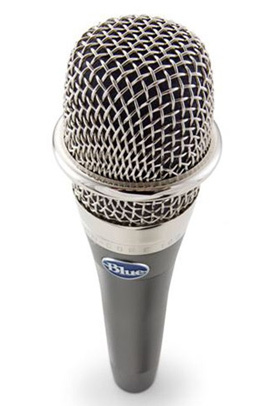 The microphone I am referring to is the Blue Microphones encore 100i. It has now become my snare microphone of choice. Why did I like it? Well, at first I wasn't sure, I just knew I liked how it sounded in that room. 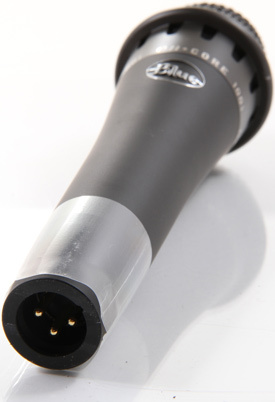 However, as with any mic worth its weight, it needs to stand up to the rigours of a tour or two, after all, you don't want to be carrying around a dud in your mic case when you are on the road. So, I took it out on the road with the esteemed gentlemen from Hot Chocolate on their most recent Australian tour. The report- it stands up alright! After 20 shows and over a dozen flights, road travel several bump in's and bump out's, there was not a dent or mark on it. Even when the drum tech hit the mic when he was showing off one day, more damage was done to the stick and the tech's ego than the mic â€“ in fact, not even a ding was left on the grille. Impressed I was. More importantly though, how did it sound? 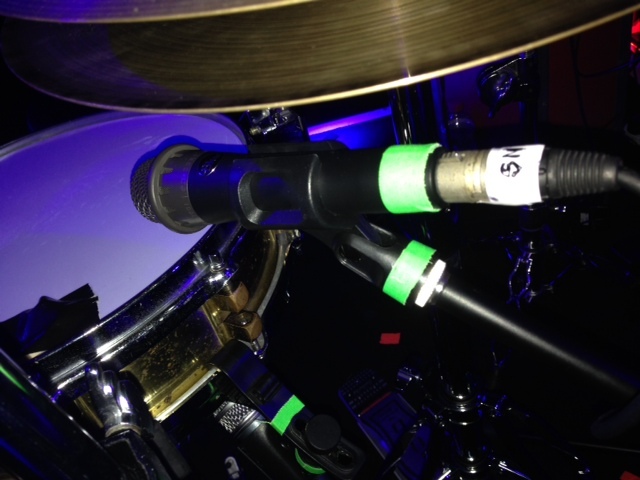 I was asked more than once on this tour, "how do you get that snare sound?" and comment was passed to me on the combination of depth and snap that the snare had. Several people commented that it "was the best snare sound they had heard" Obviously, the source of the sound- the man hitting the snare is vital to the result we hear out front, but you need the right tool to capture it! 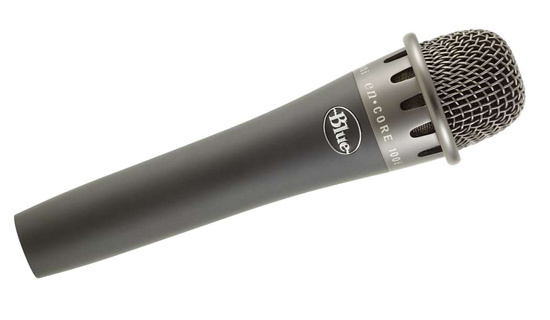 In this case, the tool was the Blue Microphones encore 100i. This mic performed above expectation. It provided me with a real deep low mid that maintained the body of the snare. With a small dip in frequency response around the 350Hz area, any murky undertones were undetectable, whilst in the upper mids, some real definitive crack and snap was achieved with crystal clarity. Perhaps the only drawback is that because of the clarity, the higher frequencies around the 8kHz can tend to be a little too present, however ,with a small amount of accurate EQ'ing, and the right amount of compression, we ended up with the most impressive snare sound that rivalled anything on the band's recordingsâ€¦.. However, here is the real point of positivityâ€¦..and, wait for itâ€¦â€¦., the drummer was playing a 13 x 3" Piccolo snare- renowned for having a high frequency ping. So in actual fact, the mic was simply picking up the natural tone of the snare, whilst adding some real depth to a snare that is not known for the deepest of undertones. To say that I was impressed with the Encore e100i is an understatement. The fact that it can handle a huge SPL (154Db) means it is going to cope with THE loudest of snare hitters around. Even though the mic is essentially dynamic cardioid in pattern, I found the focus of it to be superior to that of an SM57 and rivalled the Beta 57A. The encore 100i has become MY MIC for snare. Without question. In fact, I am such a fan of it that I convinced the boss here at SWAMP to start stocking them. So we have a couple in stock, and at a price that is cheaper than the SM57, you can not go past this for performance and value. As it is commonly said, it's the best bang for your buck aroundâ€¦.. But, don't just take my word, I'll leave that to the drummerâ€¦. "Stu, how is it that my snare sounds amazing through the monitors every night when we have a different system each time?"â€¦.. The answer lies with the e100i.